The Python was one of the monsters of Greek mythology, and although not as famous as some monsters, like the Sphinx or the Chimera, the Python was a monster who played an important role in the story of the god Apollo. The Python was a giant serpent-dragon born to Gaia, the Greek goddess of the Earth; and most sources tell of the birth of the Python from the mud left behind when one of prehistory’s great floods receded. The home of the Python would become a cave upon Mount Parnassus, for nearby was sited the navel of the earth, the centre of the known world, and here was to be found an important prophetic stone. This place was of course called Delphi, the most important oracular site in the ancient world, and because of its link to Delphi, the Python was sometimes named Delphyne. The primary role of the Python was as protector of the oracular stone, and the Oracle of Delphi that was established there. Thus, the Python was originally a tool of its mother, for the earliest temples and priestess at Delphi were devotees of Gaia, although in Greek mythology ownership of the Oracle of Delphi was then passed onto Themis and Phoebe. In the simplest stories about the Python, Apollo would come to Delphi seeking to take control of the oracular site. 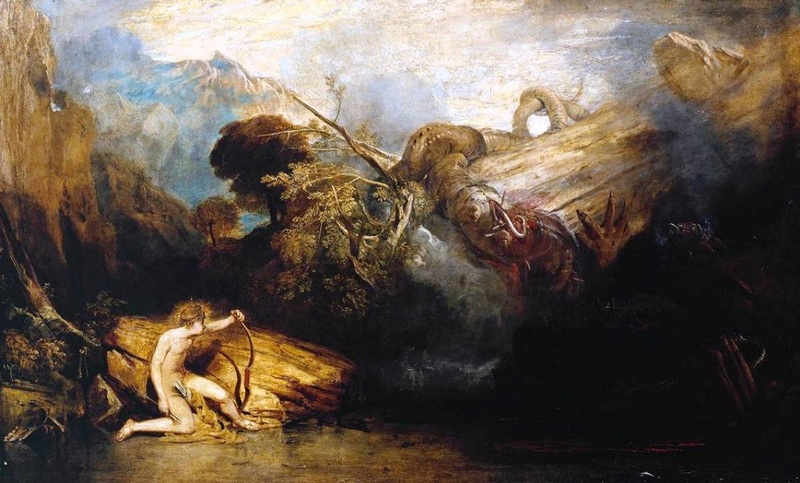 In its role as protector the Python would oppose the coming of the new god, but ultimately, the giant serpent was struck down by the arrows of Apollo, and so the Olympian god took charge of the prophetic elements of Ancient Greece. There is though a much more prosaic story in Greek mythology about the Python, and it has to do with the love life of Zeus. Zeus was having an affair with the daughter of Phoebe, Leto, and Leto had become pregnant by the god. Hera, the wife of Zeus, had found out about the affair, and had forbidden any place on land from harbouring Leto and allowing her to give birth. Some sources state how Hera also employed the Python to harass Leto so that she could not give birth. Other sources claim that the Python was not employed but acted on its own free will for it had seen its own future, a future where it would be killed by the son of Leto. Leto though found sanctuary upon the island of Ortygia, and there successfully gave birth to a daughter, Artemis, and a son, Apollo. When Apollo was just four days old, he would leave his mother’s side, and make his way to the workshop of the metalworking god, Hephaestus, who presented Apollo with a bow and arrow. Now armed, Apollo would seek out the monster who had harassed his mother. 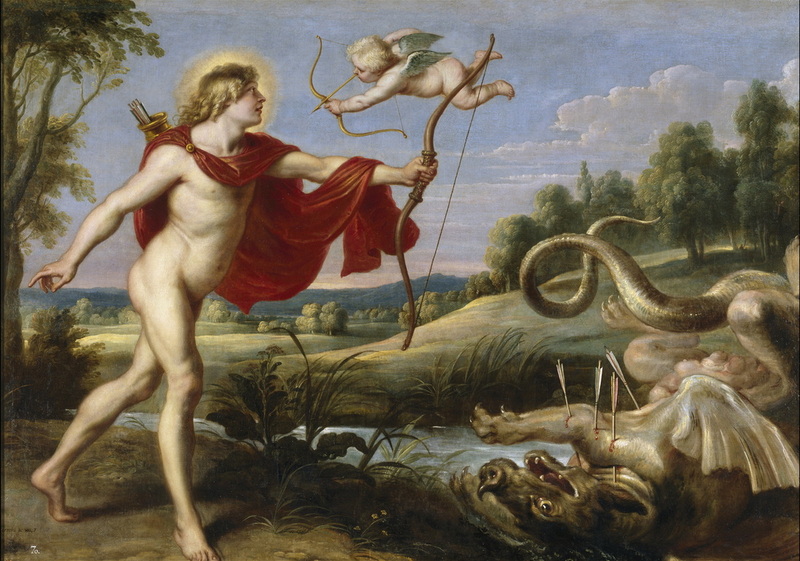 Apollo would track the Python to its cave upon Parnassus, and then fight ensued between god and serpent. The Python was not an easy opponent for Apollo to overcome, but by shooting off a hundred arrows, eventually the Python was killed. The corpse of the Python was left outside of the main Delphic temple, and so the temple and oracle were sometimes referred to as the Pytho; and likewise the priestess of the Oracle at Delphi was known as Pythia. With the killing of the Python, a symbolic ownership of the temples and oracles would pass from the old order to the new order of Apollo. Some sources tell of Apollo having to undertake a period of eight years servitude following the killing of Gaia’s child, and it might be that Apollo established the Pythian Games as an act of penance for the slaying of the Python, although equally the god might have enacted the game as a celebration of his victory. In either case, the Pythian Games were the second major Panhellenic games, after the Olympic Games. Some ancient sources would claim that the Python was simply another name for Echidna the mate of Typhon, but it is generally considered that the Python and Echidna were two different monstrous offspring of Gaia, and Echidna was said to have been killed by Argos Panoptes, if she was ever killed.